Author(s): Ramandeep Kaur, Ashish Ranjan Dwivedi, Bhupinder Kumar, Vinod Kumar. Laboratory of Organic and Medicinal Chemistry, Centre for Pharmaceutical Sciences and Natural Products, Central University of Punjab, Bathinda, Punjab, India-151001. 1,2,4-triazole is an important nucleus present in a large number of compounds. More than thirty-five compounds containing this nucleus are introduced into the market. 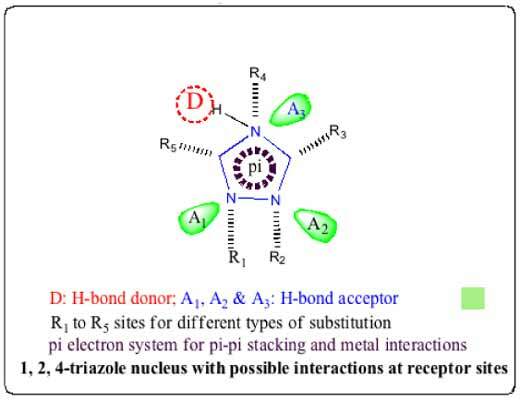 1,2,4-triazole nucleus is stable to metabolism and acts as an important pharmacophore by interacting at the active site of a receptor as hydrogen bond acceptor and as a donor. Due to its polar nature, the triazole nucleus can increase the solubility of the ligand and it can significantly improve the pharmacological profile of the drug. A large number of 1,2,4-triazole derivatives are reported to possess a wide range of bioactivities including anti-cancer activity. This review article describes the role of 1,2,4-triazole nucleus in different types of anti-cancer agents such as nucleoside based anti-cancer agents, kinase inhibitors, tubulin modulators, aromatase and steroid sulfatase inhibitors, methionine aminopeptidase inhibitors, tankyrase inhibitors and metal complex based anti-cancer agents. It is expected that the current review article will provide insight into various ligand-receptor interactions and help in the rational design and development of novel 1,2,4-triazole based anti-cancer drugs with improved selectivity for cancer cells. Keywords: 1, 2, 4-triazoles, anticancer, kinase inhibitors, tubulin modulators, structure-activity relationship. Affiliation:Laboratory of Organic and Medicinal Chemistry, Centre for Pharmaceutical Sciences and Natural Products, Central University of Punjab, Bathinda, Punjab, India-151001. Keywords:1, 2, 4-triazoles, anticancer, kinase inhibitors, tubulin modulators, structure-activity relationship. Abstract:1,2,4-triazole is an important nucleus present in a large number of compounds. More than thirty-five compounds containing this nucleus are introduced into the market. 1,2,4-triazole nucleus is stable to metabolism and acts as an important pharmacophore by interacting at the active site of a receptor as hydrogen bond acceptor and as a donor. Due to its polar nature, the triazole nucleus can increase the solubility of the ligand and it can significantly improve the pharmacological profile of the drug. A large number of 1,2,4-triazole derivatives are reported to possess a wide range of bioactivities including anti-cancer activity. This review article describes the role of 1,2,4-triazole nucleus in different types of anti-cancer agents such as nucleoside based anti-cancer agents, kinase inhibitors, tubulin modulators, aromatase and steroid sulfatase inhibitors, methionine aminopeptidase inhibitors, tankyrase inhibitors and metal complex based anti-cancer agents. It is expected that the current review article will provide insight into various ligand-receptor interactions and help in the rational design and development of novel 1,2,4-triazole based anti-cancer drugs with improved selectivity for cancer cells. Going Beyond Anthracyclines and Taxanes in Breast Cancer – What’s Next?